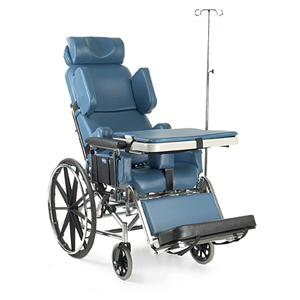 Tilt and recline features, smooth and effortless operation, and optimal positioning. They are also designed to provide maximum safety for both the user and the caregiver. The HTR features 24" rear wheels and 8" front casters for maneuverability and controlled steering. The HTR has a pan seat for use with pressure relief cushions. So look to our full and diverse line to provide the utmost in support, comfort, and ease of use. Infinite tilt positions are controlled by the trigger cable mechanism located behind the chair on the right push handle. Squeeze the trigger and the lock is released, allowing the chair to be pulled back or eased forward to the desired degree of tilt. Release the trigger and the unit will lock into the chosen degree of tilt. To assist in this function, there is a descent/ascent footbar so your arms are not doing all the work. Infinite recline positions are also controlled by a single trigger cable mechanism located behind the chair. The recline control mechanism is located on the left push handle 90 degrees to the back. Squeeze the trigger and the back is released, allowing the seat to back angle to be adjusted accordingly. Release the trigger and the back will be locked at the chosen degree of recline. To flip down the back, pull simultaneously on the two pins located in the vertical members of the back. Allow the upper portion of the back to swing down behind the lower portion. To return the back to its upright position, swing the back up and it will automatically lock in position. Many activities require the HTR user to reach, bend and transfer in and out of the HTR. These movements will cause a change to the normal balance, the center of gravity, and the weight distribution of the HTR. To determine and establish your particular safety limits, practice bending, reaching and transferring activities in several combinations in the presence of a qualified healthcare professional BEFORE attempting active use of the HTR. Proper positioning is essential for your safety. When reaching, leaning, or bending forward, it is important to use the front casters as a tool to maintain stability and balance. The approximate reach-limit values shown in the accompanying graphs were derived on the basis of a sample of 91 male and 36 female subject users. Note the difference between the maximum and the comfortable reach limits, a subjective but important consideration in design. Position the front casters so that they are extended as far forward as possible and engage wheel locks. Position the HTR as close as possible to the desired object. Point front casters forward to create the longest possible wheelbase. Reach back only as far as your arm will extend without changing your sitting position. When tilting the HTR, an assistant should grasp the back of the HTR on a non-removable (non-detachable) part. Inform the HTR occupant before tilting the HTR and remind him/her to lean back. Be sure the occupant’s feet and hands are clear of all wheels. After mastering the techniques of tilting the HTR, use this procedure to tackle curbs, short stairs, etc. METHOD 1 - Apply a continuous downward motion until the balance point is achieved and the front casters clear the curb. At this point, the assistant will feel a difference in the weight distribution. Roll the HTR forward and slowly lower the front casters onto the sidewalk. Do not let the HTR drop the last few inches to the ground. This could result in injury to the occupant. Push the HTR forward until the rear wheels roll up and over the curb. This method requires two (2) assistants. The second assistant should be positioned at the front of the HTR lifting upward on a non-removable (nondetachable) part of the HTR frame when lifting the HTR and stabilizing the HTR when the HTR is being lowered to the ground. The first assistant should stand on the sidewalk and turn the HTR so that the rear wheels are against the curb. The HTR should be tilted back to the balance point and, in one continuous upward movement, the rear wheels should be pulled up and over the curb. DO NOT return the front casters to the ground until the HTR has been pulled backward far enough for the front casters to clear the edge of the curb. Position the HTR as close as possible along side the seat to which you are transferring, with the front casters pointing parallel to it. Engage wheel locks. Shift body weight into seat with transfer. Overall Depth: Upright: 39" Recline: 52"
Seat To Floor Height: 20" or 22"